As we enjoy the summer (here in the U.S.) and a holiday weekend (celebrating Independence Day), it’s the perfect time to enjoy summer’s bounty of fresh berries! 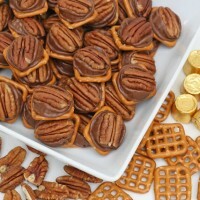 And any treat that is easy to eat and easy to transport is an extra bonus! 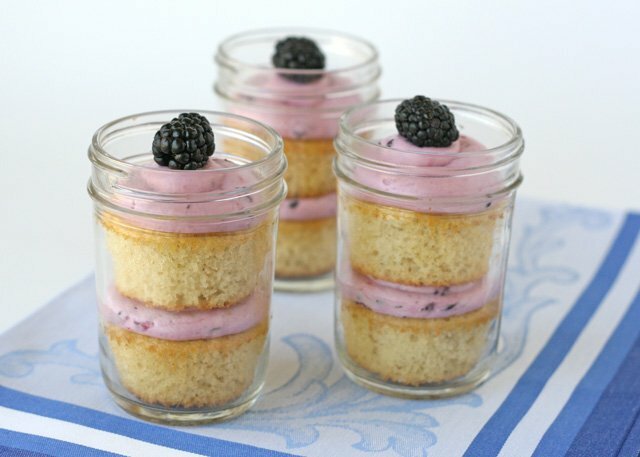 Unless you’re new here, you know I have a special place in my heart for desserts in jars. I love serving (and eating) pretty, individual treats. Whether you use the jars simply as a serving vessel- and leave them open, or top them with a lid for transport or gift giving, jarred desserts are always extra special. 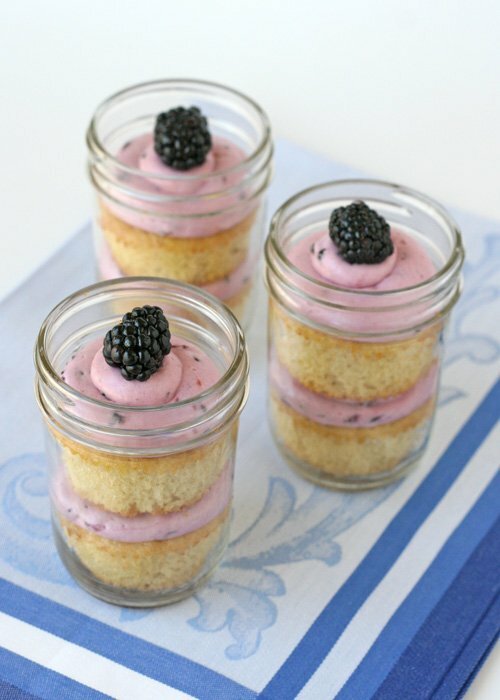 For this pretty summer treat, I layered delicious Vanilla Cupcakes with fresh Blackberry Buttercream. The frosting is so delicious! It reminded me of homemade ice cream. Using fresh, organic berries from Whole Foods Market, I experimented with the frosting, and made a second batch using raspberries. It was just as lovely, and had a beautiful pink hue. This delicious frosting is a perfect way to use fresh summer berries! In the bowl of a large electric mixer, beat the butter until smooth. Add the cream cheese, and beat further until the butter and cream cheese are fully incorporated and smooth. With the mixer on low, add the powdered sugar, one cup at a time. Again, with the mixer on low, add the blackberry puree, one tablespoon at a time. Continue beating, increasing speed to medium for about 30 seconds. Depending on the temperature in your kitchen, and the moisture in your berries, the frosting may be on the soft side. I put the whole bowl of finished frosting in the refrigerator for about 1 hour to help the frosting firm up. If needed, you could add an additional cup of powdered sugar. Frost cupcakes as desired, or layer cupcakes and frosting in a jar. Notes- To make the blackberry puree, use about 1/2 cup fresh blackberries and blend them in a food processor or blender. I left the seeds in, but you could use a strainer to remove the seeds if you prefer. This frosting is equally delicious using fresh raspberries in place of the blackberries. I have only made this recipe with fresh berries. If using frozen berries, you will likely need to use an additional cup of powdered sugar, as the frozen berries will release more moisture. 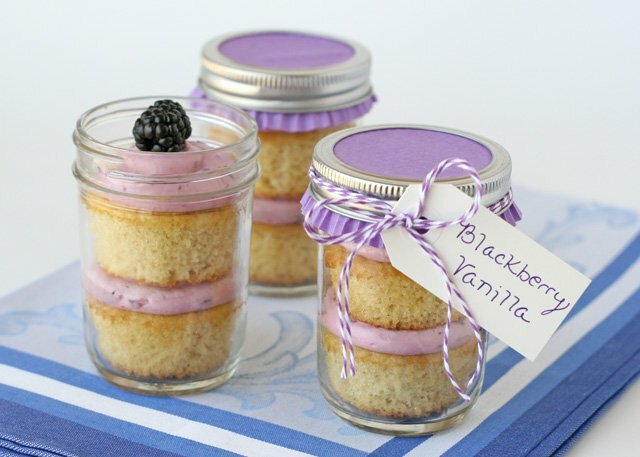 To assemble the cupcakes in a jar (as shown), I use two smallish cupcakes (using my Vanilla Cupcake Recipe). Bake the cupcakes according to the directions, using paper liners. Once the cupcakes are baked and cooled, remove the liners. For cupcakes in a jar, I usually cut the cupcakes in half (horizontally), and use a total of 1 and 1/2 cupcakes per jar, but I baked these vanilla cupcakes a bit on the small side, so two full cupcakes worked perfectly. 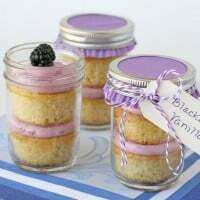 Add one cupcake into a 1/2 pint canning jar (available at Wal-Mart, many grocery stores, or on-line). Pipe a swirl of frosting. Add another cupcake, and top with another layer of frosting. Finish with a fresh berry, if desired. Serve jars open, or top with a lid. Eat using a fork or spoon. Enjoy immediately, or store in the refrigerator, topped with lids, up to two days. 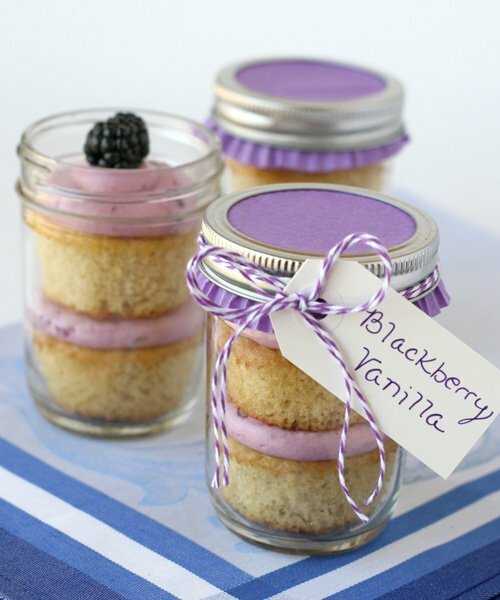 For a pretty presentation, I added a purple cupcake liner (from Confectionery House) and twine (from The Twinrey). I flattened out the cupcake liner a bit, placed it over the lid of the jar, then screwed on the lid ring. I added a little tag, and tied it with twine. I like that the finished jars reminded me of jars of jam at a county fair. Disclosure- Berries provided by Whole Foods Market, the photos, recipes and text are all my own.